Your child’s exam will last about 45 minutes. Each regular exam includes a detailed teeth cleaning, during which we will clean, polish, and rinse the teeth to remove any tartar and plaque that have built up on the surface of the teeth. Visiting our office every six months gives you the chance to ask Dr. Dana any questions you may have about your child’s oral health. Regular exams are offered by appointment only, so please contact our practice today to schedule your little one’s next dental exam and teeth cleaning. Fluoride is effective in preventing cavities and tooth decay. It also prevents plaque from building up and hardening on a tooth’s surface. A fluoride treatment in our office takes just a few minutes. After the treatment, your child may be asked not to rinse, eat, or drink for at least 30 minutes in order to allow the teeth to absorb the fluoride. Depending on his or her oral health, or the doctor’s recommendation, a fluoride treatment may be required every three, six, or 12 months. Sometimes brushing is not enough, especially when it comes to those hard-to-reach spots in the mouth. It is difficult for a toothbrush to get between the small cracks and grooves on a child’s teeth. If left alone, those tiny areas can develop tooth decay. Sealants give your child’s teeth extra protection against decay and help prevent cavities. Dental sealants are a plastic resin that bonds and hardens in the deep grooves of your child’s tooth surfaces. When a tooth is sealed, the tiny grooves become smooth and are less likely to harbor plaque. After sealants have been applied, brushing your child’s teeth becomes easier and more effective against tooth decay. Sealants are typically applied to children’s teeth as a preventive measure against tooth decay after the permanent teeth have erupted. 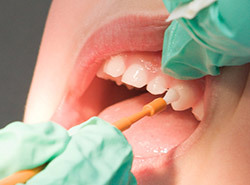 It is more common to seal “permanent” teeth rather than “baby” teeth, but every patient has unique needs, and Dr. Dana will recommend sealants on a case-by-case basis. Sealants last from three to five years, but it is fairly common to see adults with sealants still intact from their childhood. A dental sealant provides protection only when it is fully intact, so if your son or daughter’s sealants come off, let us know, and schedule an appointment for your child’s teeth to be re-sealed.